August 3, 2018 This post may contain affiliate links. 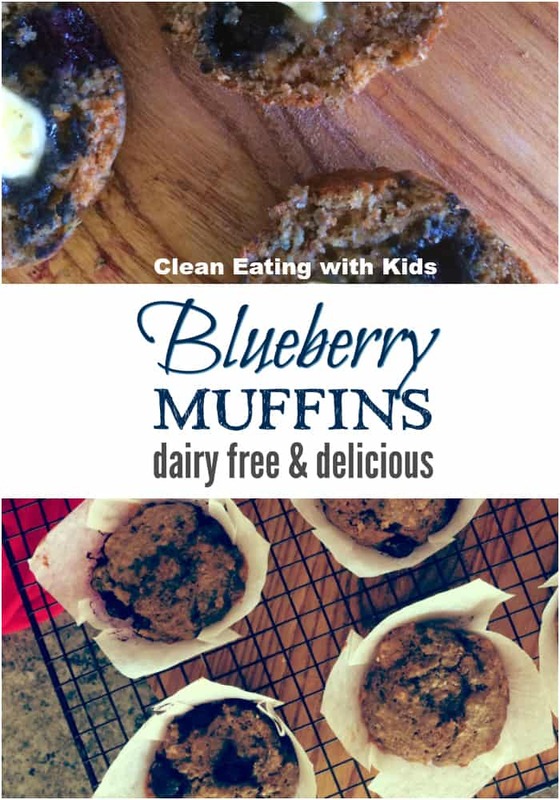 This is a super satisfying wholegrain clean eating blueberry muffin that freezes beautifully. 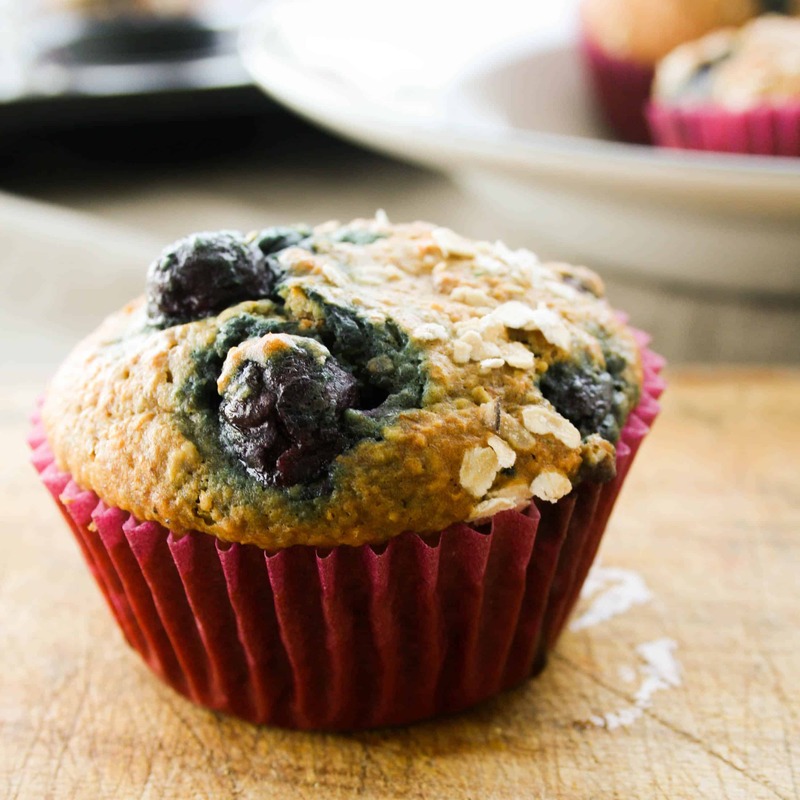 A Great last minute breakfast option for those mornings when time is not on your side or plan ahead and bake a couple batches for easy school lunchbox treats. When we first started the clean eating thing, I wasn’t really sure where we were going to go with it. My priority was eating real food and also getting chemicals and preservatives out of our diet. But not so much the quality of the ingredients I was using. When I look back at past recipes, there are many where I would use white flour instead of wholewheat. To be honest, I was hesitant to make drastic changes as I wasn’t overly confident that my family would be OK with eating 100% wholewheat foods. It was easy to cut out chemicals, but not so easy to get my family used to eating wholegrain textured baking. I had to slowly ease them in to it by replacing half the white flour with wholewheat in many of my recipes then playing around with sweetness and density. Wholewheat flour makes a recipe a lot denser and the nuttier flavor also messes with the usual sweetness. It wasn’t as easy as just switching out the the white flour for wholewheat. It took a while to get to the stage where I could make a 100% wholegrain recipe without complaints. 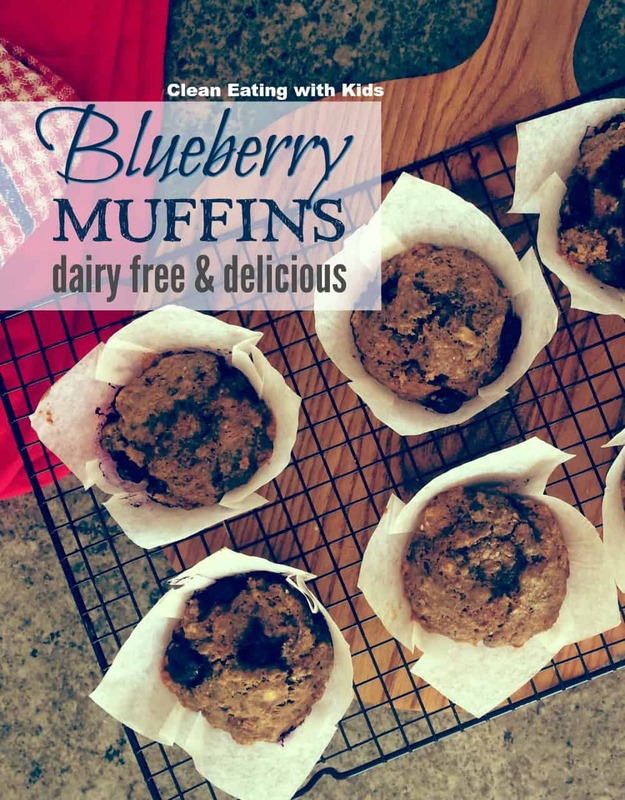 These blueberry muffins are a good example of a recipe that has evolved with my family. My original recipe used organic white flour as a base ingredient. And it was a good place to start, but I knew I could improve on them by reducing the amount of sugar and upping the goods grains. My children have also evolved in their tastes since we began eating real food. They are now all used to eating wholegrain foods and actually prefer the taste. Their taste buds have definitely changed along the way which makes eating real food a lot easier. 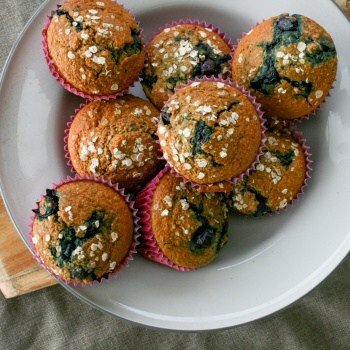 could be frozen(these blueberry muffins can be frozen for up to two months. Not that they ever get to hang around there that long. Generally, in our family, if they are in the freezer for more than a week, they weren’t that good to start). 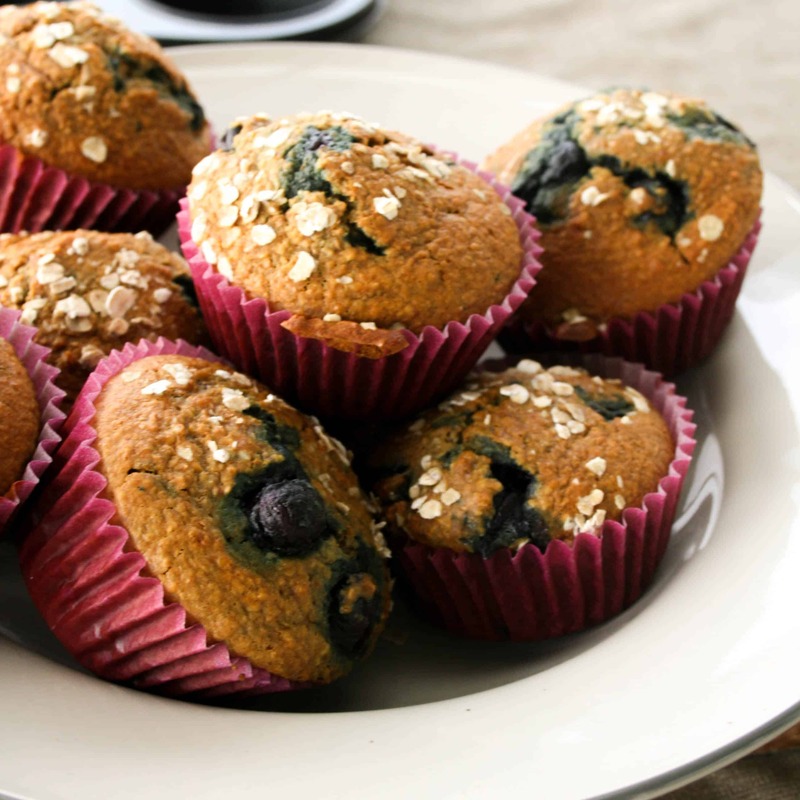 Want More Kids Friendly Breakfast Recipes? 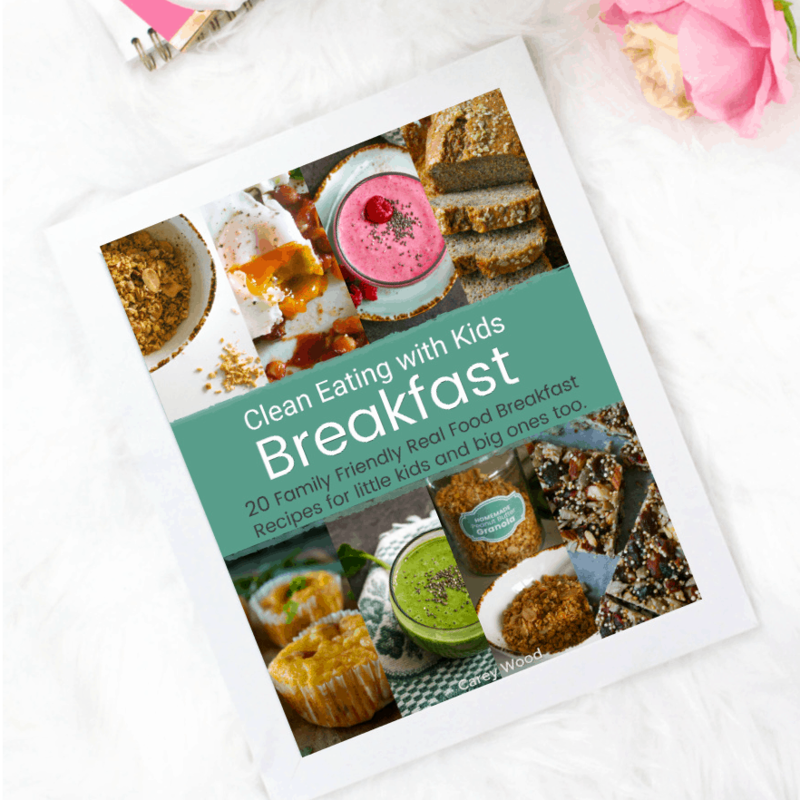 –>> Get my latest Recipe eBook here: 20 Easy to Make, Family Friendly Real Food Breakfast Recipes. Grains are getting boo hoo’ed by the health industry at the moment. And there is a genuine issue with gluten intolerance. An estimated 1 – 2% of the general population deal with this issue – it does, however, leave a staggeringly large 98% of us OK to eat whole grains. But – having said that. All grains are not created equal. I stay away from processed grains as much as possible and choose organic whenever I can. I get most of my grains and flours from Bobs Red Mill. It’s a brand I trust and use everyday in my kitchen. This is my go to whole wheat flour that I use daily ( 100% Stone Ground Whole Wheat Flour, 5lbs) . It took me a while to find a product that I was happy with. The quality and taste of bobs red mill products are excellent and their values as a company make feel happy to use them. I’m a super fan. 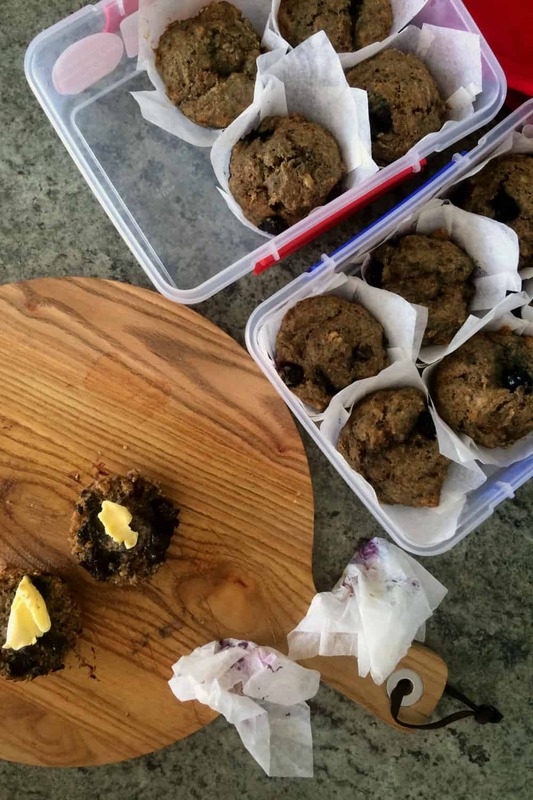 Nutty, sweet and sticky wholewheat oat and blueberry muffins. Add the wet mix to dry mix. It makes a runny batter. Gently stir in blueberries. Stir until just blended. Dont over mix. Bake for 18 – 20 minutes. Touch tops to make sure they feel spongy. Serve with a little butter.